Be the first to know what’s going on in Wilmington and our Island Beaches—Carolina, Kure and Wrightsville beaches. Get our top picks for upcoming seasonal events, things to do and trip ideas delivered to your inbox. Also receive information on holiday-related special offers and travel packages when lodging partners have them available. Enter your email address below and click submit to receive Wilmington eSpecials**. You also have the option to subscribe to our island beaches’ eSpecials**. **Our eSpecials are promotional emails about special offers, attractions and events happening in and around Wilmington, North Carolina and our Island Beaches. You will receive approximately 10 eSpecials a year. 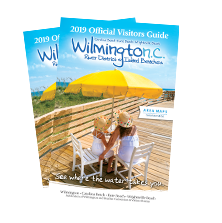 You can unsubscribe at any time, directly from the prominent links within each eSpecial, by telephone at 1-877- 406-2356, or by emailing us at visit@wilmingtonandbeaches.com with "Remove from your mailing list" in the subject line. We do not share our email lists with anyone.